Two weeks ago FAU sat in the middle of Conference USA’s pack, primed to make a run at the best C-USA tournament seed in program history. Following Saturday’s 79-68 loss at Marshall, the Owls are once again struggling to secure a berth in conference tournament. FAU has now dropped four consecutive games. The losing streak would be seven games if not for Justin Massey’s 30-foot three-pointer at the buzzer to beat lowly Rice three weekends ago. The Owls opened the weekend with a 75-63 loss at Western Kentucky on Thursday. 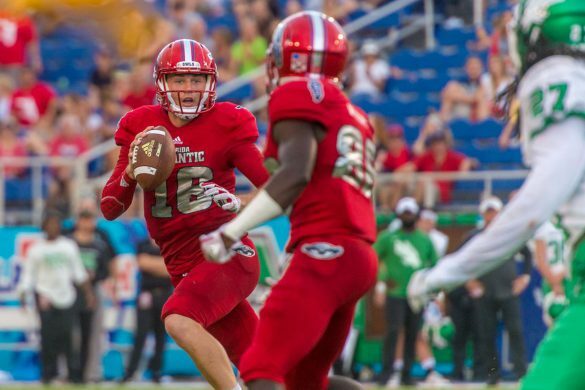 FAU remains stuck at four wins in Conference USA play. Only three C-USA teams – UTEP, Rice and Charlotte – have fewer wins in conference play. 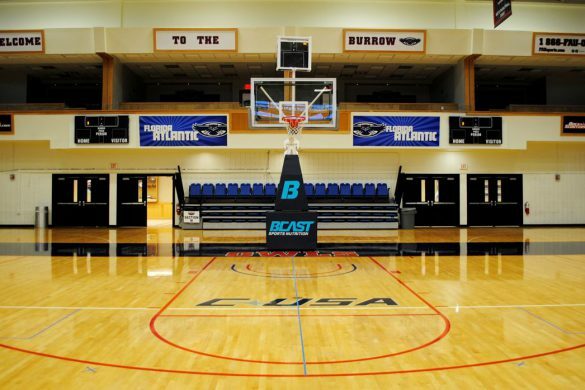 Only 12 of the 14 C-USA teams qualify for the conference tournament. The Owls still have games against Rice and Charlotte remaining during the final three weeks. The Owls already own wins over those teams earlier in the season. Saturday’s loss to Marshall, C-USA’s No. 4 seed if the tournament began tomorrow, followed a similar script to many of the Owls’ recent shortcomings. 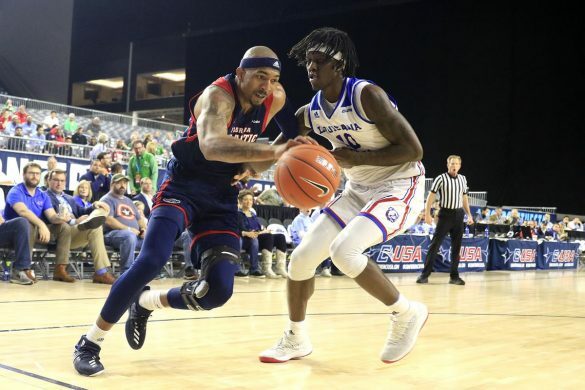 FAU held the game close before faltering in the closing minutes. Ronald Delph’s lay-in with 8:15 remaining pulled FAU within a point of Marshall, 60-59. The Thundering Herd proceeded to score the next 11 points and the Owls never truly threatened again. Moving Forward: Center Ronald Delph paced the Owls with 21 points and 11 rebounds. …Guard Justin Massey was the only other Owl to achieve double digits in scoring with 12 points. …Starting forward William Pfister only scored two points, but he did grab 14 rebounds. 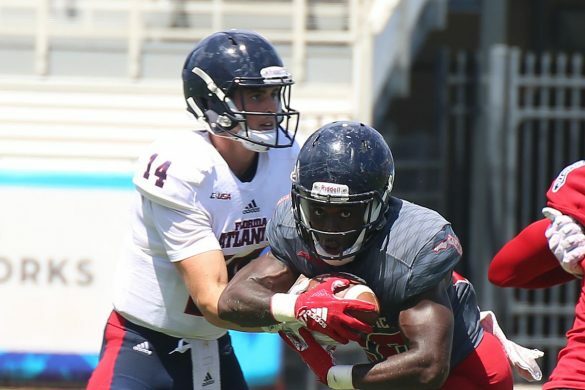 Moving Backward: Expected to be the Owl who could create offense for FAU, Jailyn Ingram managed only five points. …Starting point guard Payton Hulsey missed eight of his 10 shots. …FAU shot 34.2 percent from the field. Key Stat: 5 – Made field goals in 24 combined attempts for FAU point guards Hulsey and Anthony Adger. Up Next: FAU doesn’t play a Thursday game this week. The Owls return to the court on Saturday against FIU. Tip-off at The Burrow is scheduled for 2 p.m.
BOCA RATON – Like most young boys, Tyler Frank dreamed of playing professional baseball. 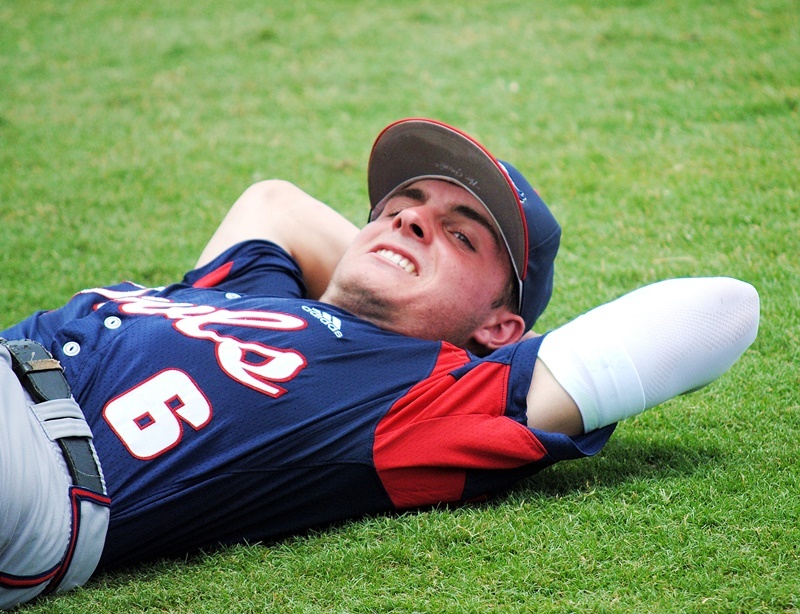 Well, now he’s older and the Florida Atlantic shortstop may be a season away from his dream coming true. 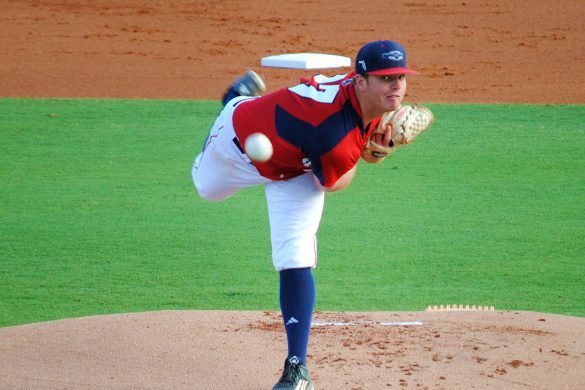 Frank returns for his third season at FAU hoping to lead the Owls back to the NCAA tournament. FAU won 35 games last season, but loss No. 21 not only ended their chances at a Conference USA title, it also ended their season. The Owls didn’t receive an NCAA tournament bid for the first time in three seasons. Expectations are high not just for the Owls, but for Frank. College baseball players are eligible to be drafted following their junior season. 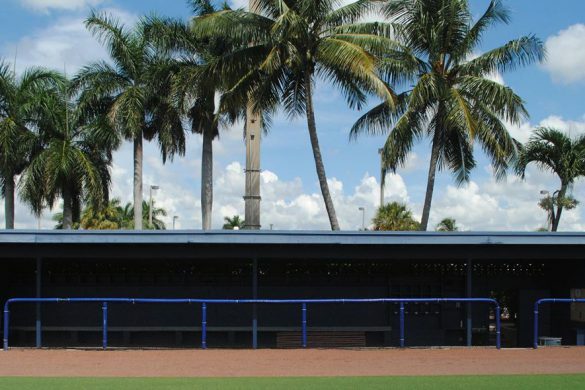 Two MLB scouts spent part of their Thursday afternoon sitting in a dugout watching FAU, and Frank in particular, practice. In that respect, Thursday wasn’t all that different than any other preseason practice. “He’s going to get drafted high enough where he’s going to get a fair amount of chances to be successful in this game,” McCormack said. Once MLB’s June draft begins McCormack doesn’t expect to wait long before hearing Frank’s name called. “His floor is the fifth round, his ceiling is the mid-second, maybe higher,” McCormack said. Before Frank does cross that bridge, he has a full collegiate season ahead of him. “He’s the catalyst of the offense,” pitcher Jake Miednik said. He’s also got the ability to play almost anywhere on the field. 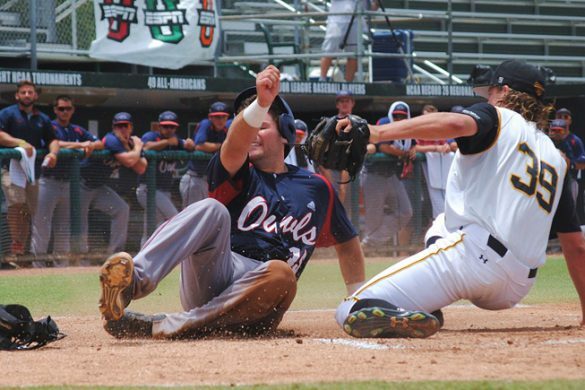 Two seasons ago when the Owls suddenly found themselves short on catchers, McCormack asked Frank, a natural middle infielder, if he’d be willing to move behind the plate. With future second-round draft choice C. J. Chatham blocking Frank’s path to playing time at shortstop the then-true freshman made the move. By the end of the season one C-USA coach told McCormack that Frank was a future All-Conference USA catcher. This past summer, Frank put the gear back on for a few games while playing with Team USA. 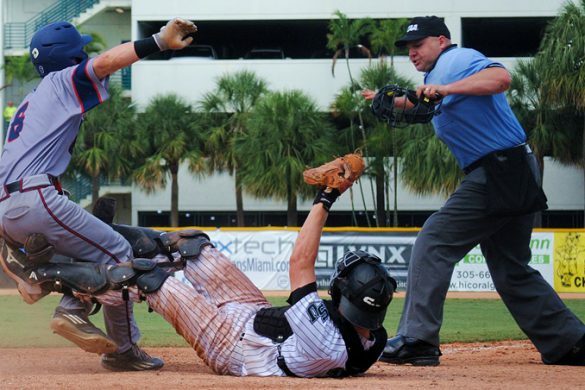 While there may be more catching in his professional future, Frank is a shortstop – and only a shortstop – for FAU this season. “Knowing that he’s behind you, you’re able to pitch more to contact, let him make some good plays for you.” Miednik said. 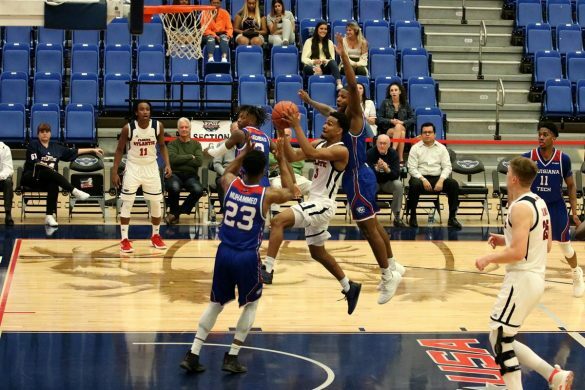 And while the start of a potentially lucrative professional career is likely only a few months away, Frank’s focus is on FAU’s Feb. 16 season opener against George Washington. 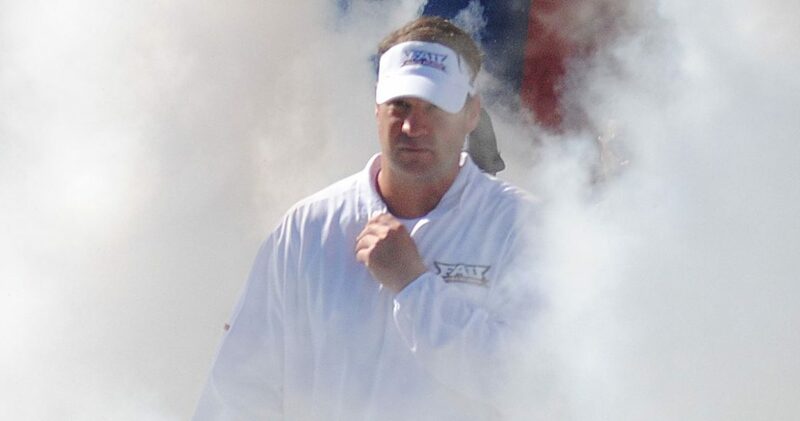 BOCA RATON – Unsure as to how the new early signing period would affect the talent level available to the Owls, Lane Kiffin adopted a wait-and-see approach. 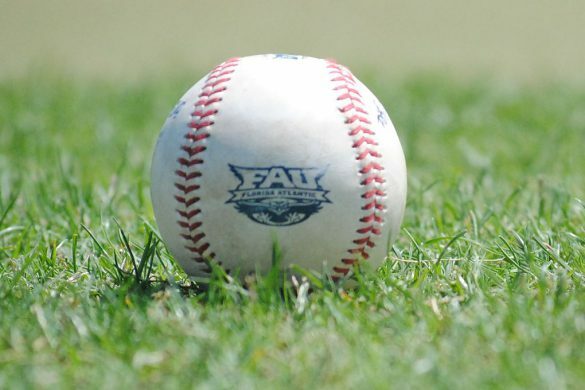 FAU formally announced the signing of 16 players on Wednesday. A day later, Lakeland offensive lineman Dacoda Weaver joined the fold – his administrative hurdle cleared. 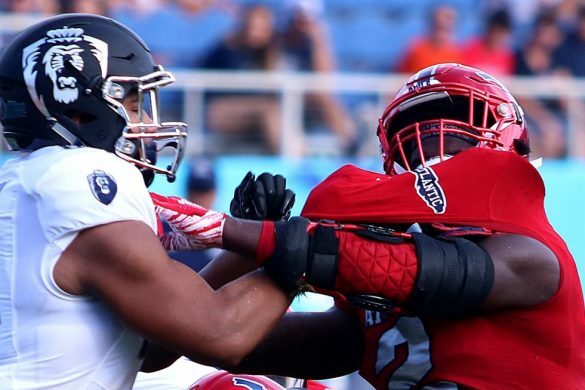 While some teams within Conference USA elected to sign more than half their class in December during the first-ever football early signing period, FAU only signed five players. Fourteen more signed on Wednesday’s National Signing Day, though two of them – former Alabama running back BJ Emmons and Longwood-Lyman defensive end Deon Woods – found themselves in a similar situation to Weaver. Emmons and Woods are expected to officially be added to the Owls’ 2018 Signing Class in short order. Emmons and Weaver are two examples of players the Owls likely couldn’t have signed in December. 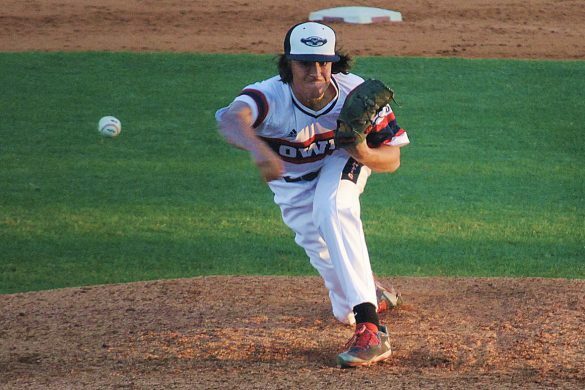 Weaver committed to Liberty before flipping to FAU earlier this week. Emmons had interest from South Carolina and Louisville. Cornerback Armani Adams was an Arizona commit. Offensive lineman Marquice Robinson drew early interest from the likes of Auburn and Mississippi St., but those schools backed off when it appeared he wouldn’t qualify academically. Robinson’s most recent report card, finalized after the Dec. 20 early signing date, showed all A’s and B’s, putting him on track to qualify. Quarterback Cordel Littlejohn spent much of his 2017 season thinking he was headed to Illinois. On Wednesday he signed with FAU. 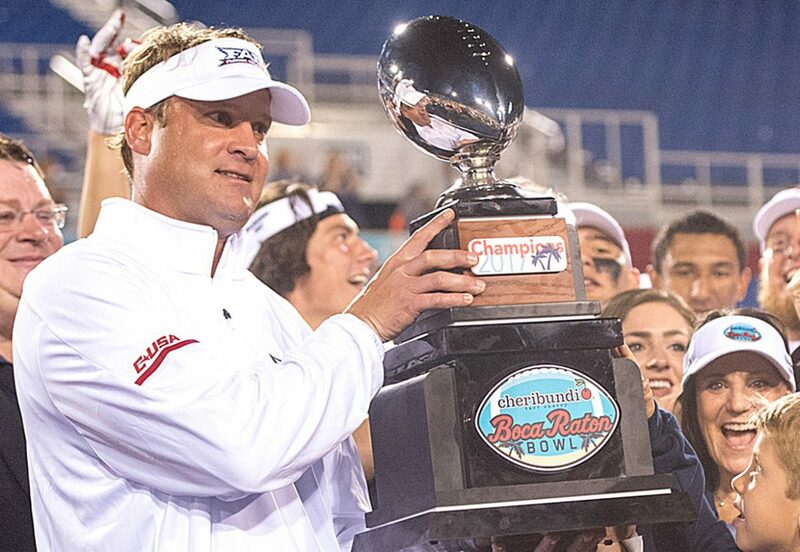 “We battled a lot of Power 5 schools on a lot of these kids,” Kiffin said. BOCA RATON—One theme is clear in FAU’s 2018 signing class: The Owl brand is spreading nationally. FAU had only one signee – Palm Beach Lakes’ Teja Young, a future cornerback – from South Florida. 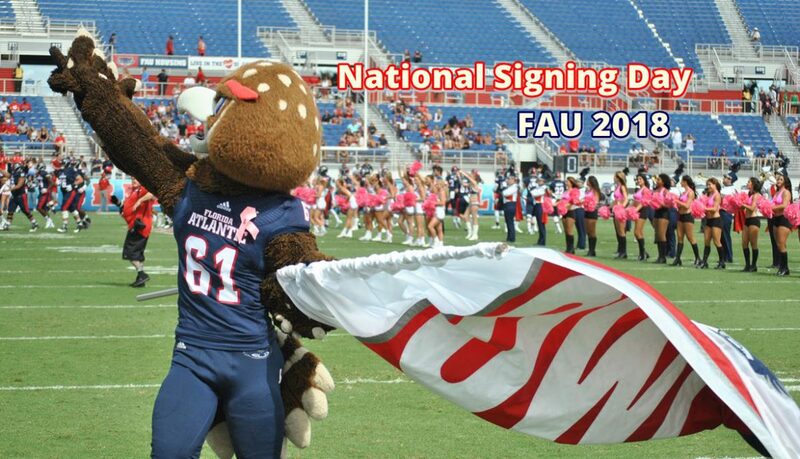 For the first time in program history, FAU put the “National” in National Signing Day. 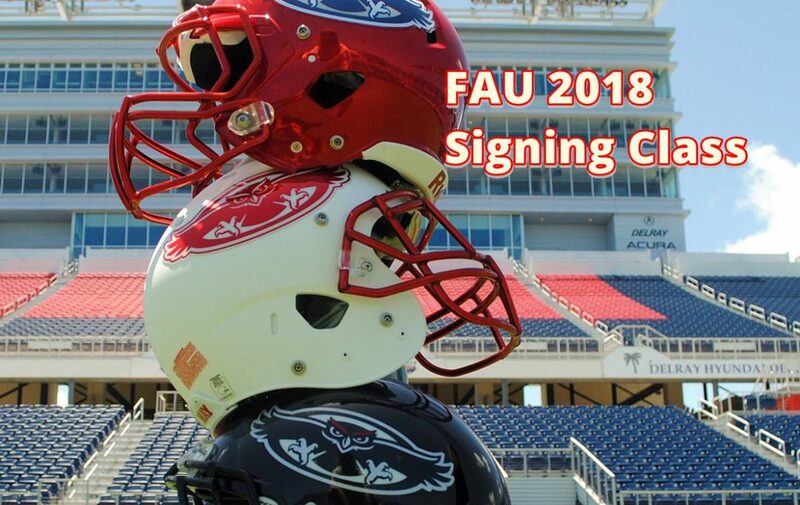 As part of FAU’s 2018 signing class, FAU signed players from North Carolina, Alabama, Mississippi, Texas, Idaho and California. 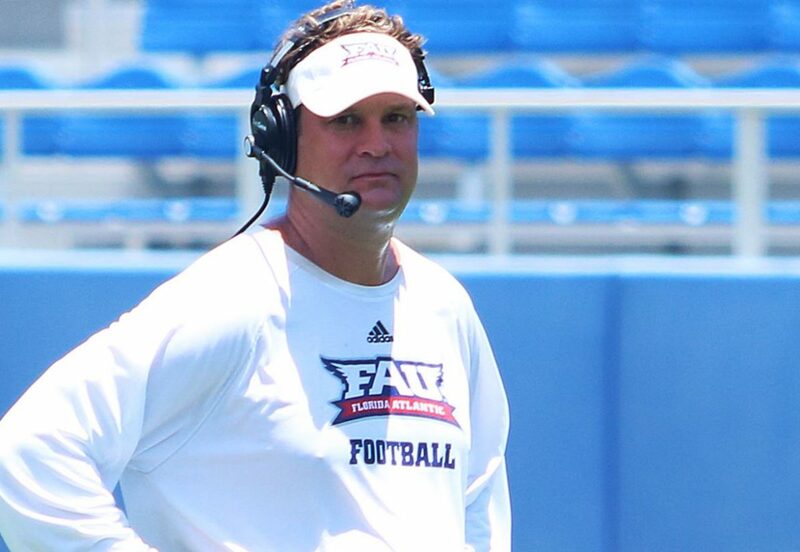 Last year FAU signed five South Floridians and have historically recruited heavily in the area but Kiffin said the Owls are looking to break previous expectations. “How’d that work for you?” Kiffin said. Seven FAU signees have Florida roots. Last year FAU signed 12 Floridians. 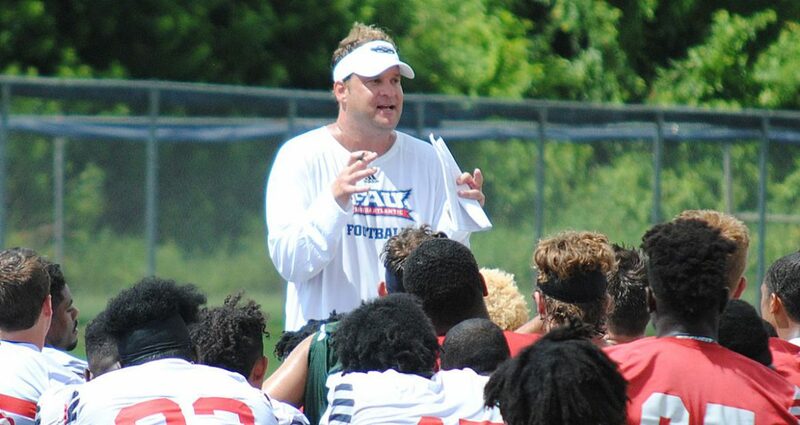 Kiffin disagreed with people who said upon his arrival to FAU that the talent level in South Florida was so high he didn’t need to recruit elsewhere, arguing that, while local recruiting is important, national recruiting is what takes teams to the next level. “We want most of our players to come from South Florida but we are going to find the best players that we can because that’s our job,” Kiffin said. Under Kiffin, the Owls gained the kind of national exposure that had eluded them since launching the program in 2000. 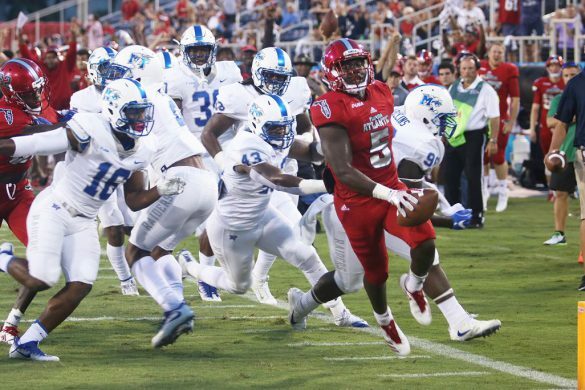 The Owls won their first Conference USA title and blew out Akron in the Boca Raton Bowl – the only college football game on television that night. 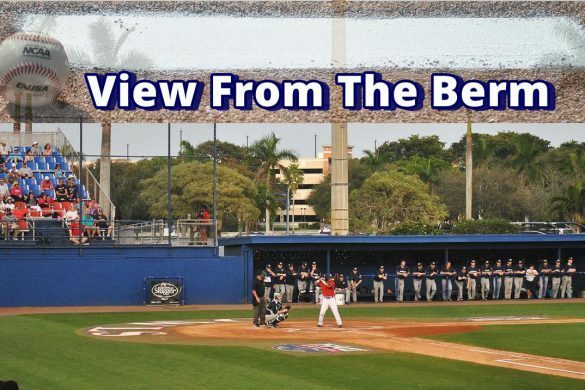 FAU won its final 10 games in 2017, showcasing an explosive, entertaining style of play. And the Owls made headlines off the field with Kiffin’s unique Twitter persona. Kiffin had high praise for Teja Young, comparing the lone South Florida-native to sign with the Owls, comparing him to All-Conference USA safety Jalen Young. “Really dynamic player, when the ball gets in his hands,” Kiffin said. “He finds a way to make plays,” Kiffin said. Capable of playing multiple positions, Teja played quarterback for Palm Beach Lakes last season because that’s what the Rams needed. BOCA RATON – Most will look at BJ Emmons’ decision to sign with FAU, point to year he played at Alabama under offensive coordinator Lane Kiffin and conclude he simply wanted to play for Kiffin again. Emmons, however, insists there’s more to it than that. “I already know how Kiffin rolls,” Emmons said. A different coach, one on Kiffin’s staff is the one who ultimately prompted Emmons to choose FAU. During his visit to Boca Raton Emmons sat with running backs coach Kevin Smith, talking football philosophy and breaking down film. “I got a good bond with coach Smith,” Emmons said. FAU’s official Signing Day release did not include Emmons, but Emmons did sign relatively late in the day, which could be the reason for the holdup. The Owls also didn’t officially announce the signing of Lakewood-Lyman defensive end Deon Woods. NCAA rules forbid coaches from commenting on players until their signing paperwork is complete. Kiffin did say he expected more signings to be announced shortly. Emmons played one season at Alabama before transferring to Hutchinson CC, where he averaged 4.6 yards per carry and scored 10 touchdowns in 12 games for Hutchinson. He fumbled the ball seven times, losing four of them. Once Emmons is official he’ll join speedy Kissimmee-Osceola running back Malcom Davidson in FAU’s 2018 recruiting class. They join what was already a crowded backfield, highlighted by record-setter Devin Singletary, who led the national with 31 touchdowns in 2017. Emmons knows what to expect from a Kiffin-led offense. Emmons is the most recognizable name to sign with FAU on Wednesday, but he wasn’t the most surprising. That honor goes to Austin (Ala.) offensive lineman Marquice Robinson. The 6-foot-4, 315-pound interior lineman drew interest from SEC schools early in the recruiting process but their interest faded as Robinson’s academic concerns mounted. Robinson appears to have steadied the ship, but that happened too late for the Power 5 schools. Robinson entered the week believing he would sign with FCS-level Chattanooga, but FAU came through with an offer on Tuesday. FAU’s 2018 Signing Class, as announced, contains 16 signees. More than any other class in program history, FAU’s 2018 signing class is a national class. “We were able to go national more than this school ever has and national for kids that this school probably wouldn’t get,” Kiffin said. Five receruits signed in December’s early signing period. Ten signed on Wednesday. Two more, former Tulane center Junior Diaz and former Auburn wide receiver Kyle Davis, are transfers. The Owls are currently battling Washington St. for the services of Consumnes Oaks (Calif.) corner Kahlef Hailassie, whose decision could come in the immediate future or take several days. Hailassie skipped the signing ceremony in his community to further deliberate. Of the eight signess who hail from Florida, only Palm Beach Lakes cornerback Teja Young is a South Florida product. FAU did not sign any players from Broward or Miami-Dade counties, however Diaz played with current FAU left tackle Reggie Bain at Miami-Central. 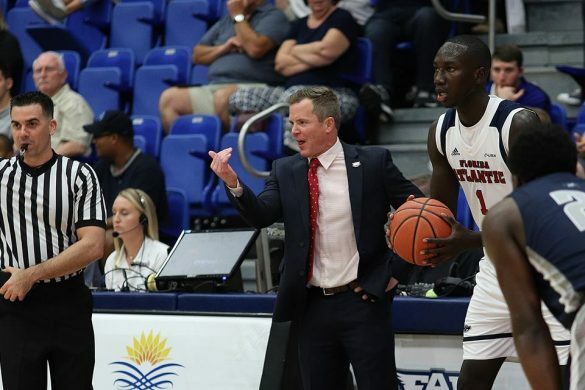 Transfer Jovon Durante, who came to FAU from West Virginia during the summer, played at Miramar. The Owls went heavy in the trenches, signing five offensive linemen and five defensive linemen. 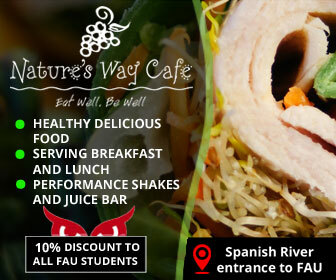 FAU did not sign a tight end or linebacker as part of the class. FAU did lose a couple of Signing Day battles. Alabama RB Kavosiey Smoke had an FAU hat on the table in front of him but ultimately donned a Kentucky hat. Another Alabama product, cornerback JaKorey Hawkins didn’t stray from his commitment to Mississippi, signing with the Rebels. Georgia offensive lineman Travis Glover elected to stay close to home and play at Georgia St.
Lane Kiffin is about to learn the composition of his second recruiting class at FAU. Follow all the signings and the disappoints – should there be any – on OwlAccess.com. 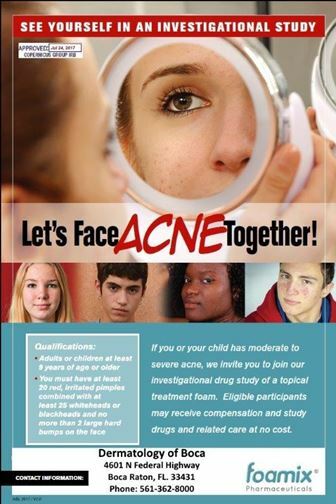 We’ll be tweeting the latest news. Below the Tweet Box we’ll list FAU’s 2018 signees along with some pertinent information about them. Meiko Dotson CB (5-10, 190) Garden City CC – Primarily a corner, Dotson began his career at Georgia Tech, where he recorded two tackles before transferring to Garden City. Dotson’s four interceptions in 2017 tied him for No. 18 nationally at the JUCO level. “I felt like that was the best spot to prepare for the next level.” – Dotson via text message. Doug Johnson OL (6-5, 320) Fort White – A big guy who can move, Johnson was a four-year starter at Fort White. Offers included Southern Miss and FIU. “He wants to play left tackle. He wants to be a premiere left tackle. He wants to go to the NFL.” – Fort White coach Demetric Jackson. Jaylen Joyner DE (6-4, 250) Orlando-Jones – Teammate of early signee Devin Hayes last season. Played defensive end in high school but could move to the interior at FAU. “For a big guy, he has a very high motor and really quick-twitch movement.” – Jones coach Andrew Anderson. Cordel Littlejohn QB (6-4, 190) Lincolnton (N.C.) – Threw for 50 touchdowns and more than 3,500 yards as a junior. Former Illinois commit. Lane Kiffin told Littlejohn that he reminded him of Alabama quarterback Jalen Hurts. “He really likes how I can throw the ball and run the ball.” – Littlejohn relaying Kiffin’s comments. Marquice Robinson OL (6-4, 315) Austin (Ala.) – Schools like Auburn and Mississippi St. showed early interest but backed away because of academic issues. Strong first semester of senior year – all As and Bs – have Robinson on track to qualify. Started 41 games over three seasons. Can play guard or tackle. “They’re getting a steal.” – Austin coach Jeremy Perkins. Teja Young Ath (5-11, 175) West Palm Beach–Palm Beach Lakes – Arguably the most athletic of FAU’s signees, Young can help the Owls in all three facets of the game. Played quarterback as a senior, but his offensive contributions likely won’t come there. Formerly a Colorado St. commit, Young can play corner or safety and will also return kicks. “They said they wanted him to play both sides of the ball. I’m going to assume they are going to find a package for him.” Lakes coach Al Shipman. Deon Woods DE (6-5, 220) Longwood-Lyman – Raw athlete who only played one full season of high school football, Woods recorded double-digit sacks as a senior. Prior to playing football, Woods ran track, high jumped and played basketball. “His motor, That’s what’s probably the most unique about him,” – Lyman coach Dennis Thomas. 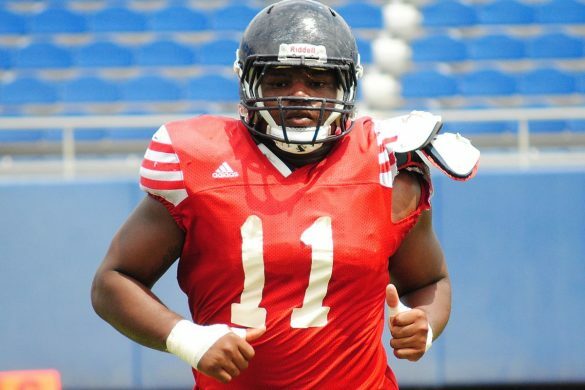 Devin Hayes OL (6-6, 250) Orlando-Jones – Could actually play offense or defense for the Owls. Committed to FAU during a visit to watch the Shula Bowl. Is a defensive end who moves like a tight end. “I want to be part of a winning program.” – Hayes. Desean Holmes WR (5-10, 180) College of the Canyons – Originally signed with San Diego St. Recruited to USC while current FAU coach Lane Kiffin coached the Trojans. Could also make an impact as a kick returner. “If things happen twice, it was meant to be. It’s kind of crazy how that worked out.” – Holmes on finally getting to play for Kiffin. Franklin “Tre” Jackson DE (6-2, 225) Winter Garden-West Orange – Chose FAU over Air Force and Maryland. Recorded 12 sacks as a senior. “The coaching staff is great and the medical program is top notch.” – Jackson. Nero Nelson WR (6-0, 180) Copiah-Lincoln – A former Mississippi St. commit, Nelson can play wide or in the slot. Similar in style, but much bigger than, former FAU wide receiver Lucky Whitehead, Nelson could also return punts or kicks. ““He’s kind of an electric guy when he gets the ball in his hands.” – Copiah-Lincoln coach Glen Davis. BOCA RATON – Wednesday could have more FAU-related drama than most recent National Signing Days. Entering Wednesday, at least nine players who are either uncommitted or are soft commits could end up signing with FAU. And that would be on top of the 15 players who have either already signed during the early signing period, announced plans to transfer, or committed to the Owls over the past couple months and will sign on Wednesday. The Owls will be watching three different time zones come sunrise, starting in Lakeland. Offensive lineman Dacoda Weaver had been committed to Liberty but backed away from that commit on Monday, a couple days after he met new FAU offensive line coach John Garrison for the first time. Lakeland coach Bill Castle said he expects Weaver to sign with FAU. In the central time zone, the Owls will be hoping to beef up the middle of their defense. A signing by Tyler J.C. defensive tackle Marcel Southall would go a long way toward accomplishing that goal. The former Texas Longhorn visited FAU in early December but didn’t sign with anyone during the early period. On Wednesday he will decide between FAU and Louisiana-Lafayette. Before lunch the Owls will turn their attention to the west coach where Consumnes Oaks defensive back Kahlef Hailassie, seems intent on revealing his choice via a signing day video. A former Colorado commit, Hailassie appeared ready to head to FAU before visiting Washington St. this weekend. Closer to home, Boynton Beach linebacker Abraham Beauplan has yet to announce his decision. The Owls enter Wednesday without an announced linebacker commit. 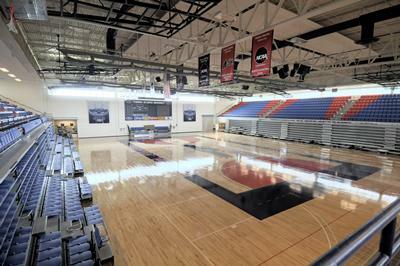 OwlAccess.com continues to hear unconfirmed talk that Hutchinson CC running back B.J. Emmons is reuniting with Lane Kiffin. Emmons spent his freshman year at Alabama in 2016, when Kiffin served as the Crimson Tide’s offensive coordinator. Emmons averaged 4.6 yards per carry and scored 10 touchdowns in 12 games for Hutchinson. He fumbled the ball seven times, losing four of them. The Owls also still appear to have a puncher’s chance at another running back, Wetumpka’s (Ala.) Kavosiey Smoke. A tremendous athlete, Smoke is expected to sign with either North Carolina or Kentucky, but he enjoyed his visit to FAU, hasn’t publicly put said the Owls are no longer a consideration, and could decide the Lane Train is the best mode of transportation to an NFL destination. Another Alabama product, JaKorey Hawkins, visited FAU while committed to Ole Miss and his coach, Tyrone Rogers, said the visit went well. Hawkins has since taken his official visit to Mississippi and remained quiet about the decision. Dooly Co. (Ga.) tackle Travis Glover could be one more piece of the offensive line puzzle – and a corner piece at that. 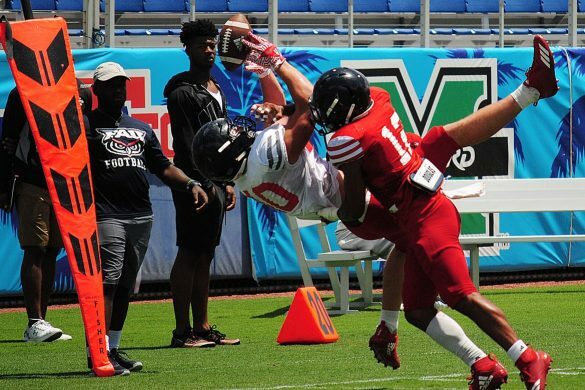 Glover visited Western Kentucky this past weekend – two weeks after visiting FAU – and he could well be choosing between the two C-USA schools. Georgia St., another school Glover visited, could also be in the mix. Finally, College of the Canyons offensive lineman Carlton Lorenz had hoped to announce a decision on Monday, but that day passed without word. Lorenz visited FAU but did not leave with an offer from the Owls. He may be holding out for that offer – a wait that could extend beyond Wednesday. Those are the prominent names linked to FAU, but with Lane Kiffin being involved there’s always the likelihood of a surprise or two. Last year D’Anfernee McGriff wasn’t linked to FAU until he signed his NLI. During this year’s recruiting process, FAU asked several commitments to keep their decisions quiet. There could well be a few such players yet to be identified. 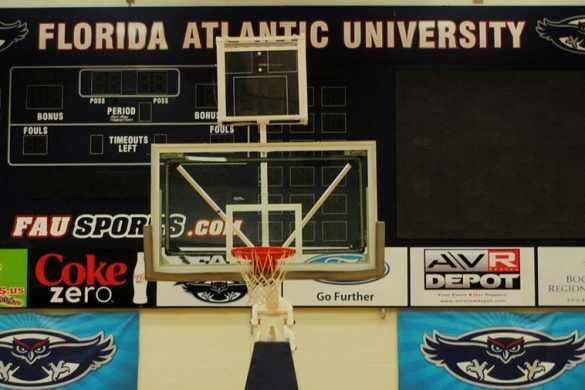 FAU is expecting nine players who have previously committed to sign on Wednesday. Two, Longwood-Lyman defensive end Deon Woods and Orlando-Jones defensive end Jaylen Joyner, are defensive linemen. Two defensive backs, corner Meiko Dotson of Garden City CC and Armani Adams of St. Petersburg-Lakewood, are also expected to become Owls. Palm Beach Lakes athlete Teja Young could eventually settle at safety. He, too, is expected to sign on Wednesday. Two more commits – Arizona Western center Zack Bennett and Fort White tackle Doug Johnson – are offensive linemen. The Owls also hope they have their quarterback of the future in Lincolnton’s (N.C.) Cordel Littlejohn, and their breakaway running back in Kissimmee-Osceola’s Malcolm Davidson. Former Tulane center Junior Diaz has already completed the paperwork required to transfer. FAU will likely formally announce his addition on Wednesday. Of the five players who signed with FAU in December’s early signing period, only Copiah-Lincoln defensive tackle Charles Cameron is already on campus. His community college teammate, wide receiver Nero Nelson, is finishing his academic work at Copiah-Lincoln and isn’t expected until the summer. The same is true for College of the Canyons wide receiver Desean Holmes. Orlando-Jones defensive end Devin Hayes and Winter Garden-West Orange defensive end Franklin “Tre” Jackson are completing their high school senior years. Johnson missed nearly all of 2017 after undergoing surgery to remove blood clots from his arm. 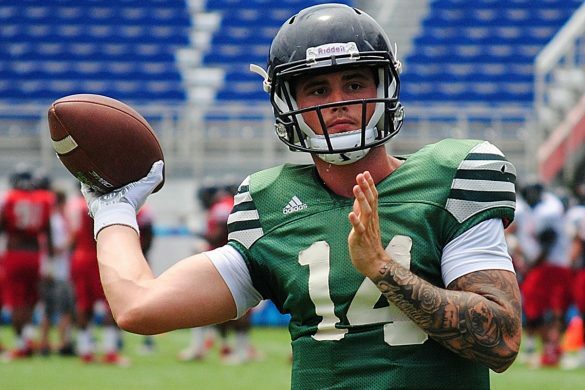 A former Florida St. signal caller and a star quarterback of the second season of the Netflix docu-series “Last Chance U,” Johnson will be competing in his second spring for FAU. The rising redshirt junior enjoyed a strong spring a year ago before struggling with accuracy and arm strength during fall camp. Daniel Parr ultimately passed both Johnson and Jason Driskel on the depth chart to earn the start in the Owls’ first three games. Johnson played in the season-opening loss to Navy, completing two passes for five yards. His only other pass resulted in an interception. Johnson also carried the ball four times for 31 yards. That marked his final game of the season. Johnson returned to practice late last season but did not participate in drills. 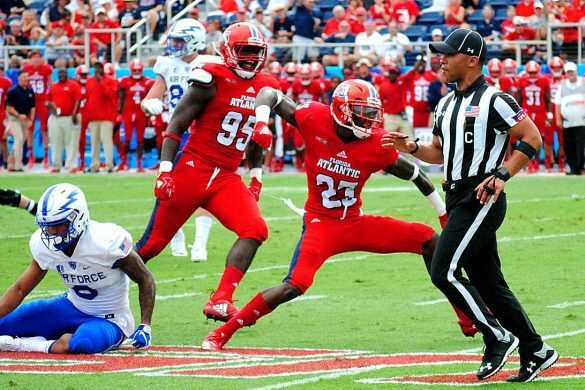 FAU intends to bring Johnson along slowly in the spring, likely limiting his repetitions early. A dual threat quarterback, Johnson will battle Oklahoma transfer Chris Robison, a redshirt freshman, during the spring for the starting job. Parr elected to transfer to Duquesne for the spring semester. Driskel started the Owls’ final 11 games of 2017, leading FAU to 10 consecutive victories to finish the season. He elected to forego his final year of eligibility. As part of their recruiting conversations, FAU coaches have told recruits that Johnson will return for the spring. FAU intends to sign Roswell (Ga.) quarterback Cordel Littlejohn as part of Wednesday’s National Signing Day, but Littlejohn won’t arrive in Boca Raton until the summer. The Owls begin spring practice on March 20, with the annual spring game planned for April 21. BOCA RATON – Charlie Weis Jr. parlayed one season as an Atlanta Falcons’ offensive analyst into a $130,000 salary increase compared to what he was making at FAU prior to the jump. The youngest offensive coordinator at the FBS level, Weis, 24, will make $180,000 per year during his three year FAU contract, obtained via a public records request. He is also entitled to a $2,500 bonus if FAU wins Conference USA’s East Division and $5,000 if the the Owls win the C-USA title. FAU accomplished both last year en route to an 11-3 season that culminated with a 50-3 blowout of Akron in the Boca Raton Bowl. Shortly after the Owls hired Lane Kiffin to be their head coach in December of 2015, Kiffin tabbed Weis to be his tight ends coach. Prior to the hiring, Kiffin had been Alabama’s offensive coordinator, with Weis serving as a Crimson Tide offensive analyst. Weis served as the Owls tight ends coach for about one month before departing to Atlanta. Under his 2017 contract, Weis would have made $50,000 per year as the Owls’ tight ends coach. While Weis more than tripled his FAU salary from his prior stint as an Owl, he’s still a relative bargain. Kendal Briles, the coordinator Weis succeeds, earned $350,000 last season in his only year as an Owls coach. According to USA Today’s annual survey of coaches’ salaries, Briles was the highest paid assistant in C-USA last season. Briles left FAU for Houston following the season. The same survey showed that 23 C-USA coaches earned more than $180,000 in base salary during 2017, including FAU defensive coordinator Chris Kiffin, who made $300,000. Second-year FAU defensive line coach and recruiting coordinator Eric Mathies’ contract calls for him to earn a base of $210,000 in 2018. Weis will also coach FAU’s quarterbacks. This is his first on-field coaching position. 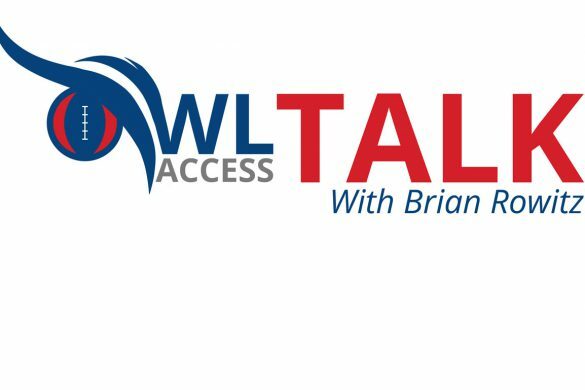 OwlAccess.com also learned through a separate public records request that new FAU defensive backs coach Wes Neighbors agreed to a two year contract that will pay him $110,000 in 2018 and $125.000 the following year. Neighbors’ contract also a offers a bit of a savings over that of his predecessor. Corey Batoon’s contract called for him to make $120,000 per year. Batoon also served as the Owls’ special teams coordinator in 2017. He left FAU following the season to become Hawaii’s defensive coordinator. A new NCAA regulation that took effect in January allows schools to have 10 on-field assistant coaches – one more than in previous seasons. FAU used that additional coaching spot to hire Jaron Fairman as special teams coordinator. 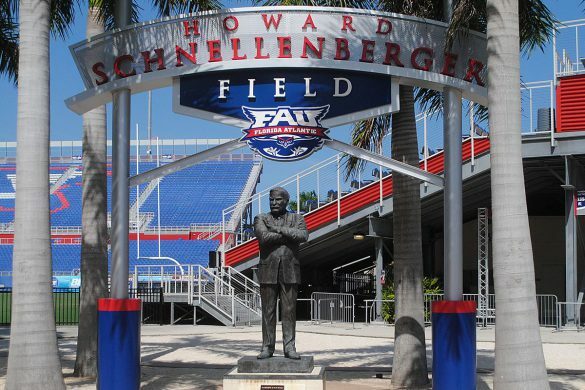 FAU formally announced on Monday that the Owls will begin spring practice on March 20. BOCA RATON – While FAU won’t know with certainty what its 2018 recruiting class will look like until Wednesday, Monday should offer a degree of clarity. The Owls are in the mix for several players who don’t intend to wait until National Signing Day to pick their school. College of the Canyons offensive linemen Carlton Lorenz visited FAU last weekend, then immediately flew to Birmingham to visit UAB. He expects to have a decision on Monday. Thompson (Ala.) linebacker Jalen Rayam visited UAB this weekend. Prior to the visit he told 247Sports that he’ll announce a commitment on Monday. Hutchinson C.C. running back B.J. 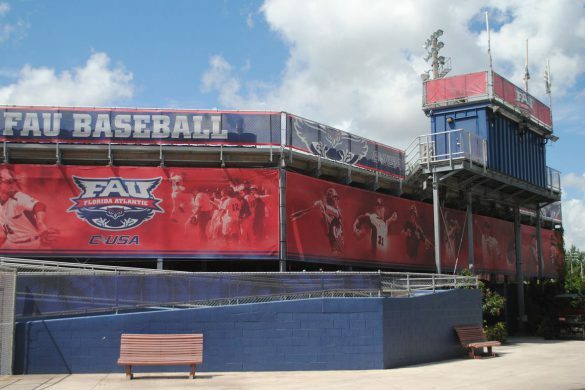 Emmons visited FAU two weekends ago. OwlAccess.com continues to hear rumblings that the former Alabama running back has decided to reunite with Lane Kiffin, but a formal decision has yet to be announced. Iowa Western linebacker Val Martin visited North Carolina St. this weekend. He visited FAU three weekends ago and told OwlAccess.com on Friday that FAU remains in his Top 3. FAU continued its push for Lakeland offensive lineman Dacoda Weaver this week. A Liberty commit, Weaver visited FAU before the Owls hired new offensive line coach John Garrison. This week Garrison visited Lakeland, meeting Weaver for the first time. Lakeland coach Bill Castle said that meeting went well, but as of Friday Weaver was still committed to Liberty. Consumnes Oaks (Calif.) cornerback Kahlef Hailassie says he loved everything about FAU, but has yet to make his decision. The former Colorado commit visited Washington St. this weekend and also made a trip to Utah St. since his official visit to FAU. The Owls paid Hailassie a visit this past week. On of coach Lane Kiffin’s stops this week was in Dooley County, Ga., to visit offensive lineman Travis Glover, who visited Western Kentucky this weekend. FAU is still in the mix for Wetumpka (Ala.) running back Kavosiey Smoke. Kiffin visited him on Jan. 25. The Owls are battling North Carolina and Kentucky for his services. Lee (Ala.) cornerback JaKorey Hawkins remains committed to Ole Miss, but the Owls still have a shot. An official visit to Ole Miss seems to have strengthened his commitment. Should Hawkins spurn the Owls, Hailassie may jump aboard the Lane Train. Tyler Junior College defensive tackle Marcel Southall showed early interest in FAU, visiting during the first weekend in December. Southall elected not to sign during the early signing period and remains uncommitted. 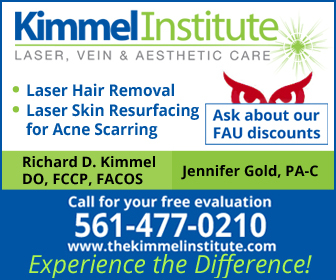 He told OwlAccess.com that FAU is still on his shortlist, but all has been quiet on the Southall front of late. And Boynton Beach linebacker Abraham Beauplan has been quiet since his visit to FAU during the Jan. 20 weekend. The Owls do not have a linebacker commit as part of their current recruiting class. 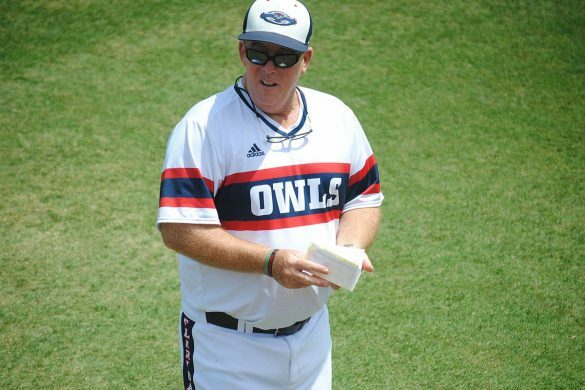 FAU entered the final weekend of the recruiting season with 15 new players either signed or committed to the Owls. That total includes Tulane graduate transfer Junior Diaz. The Owls also have three players – Oklahoma QB transfer Chris Robison, West Virginia WR transfer Jovon Durante and Auburn WR transfer Kyle Davis – who will likely count toward the NCAA limit of 25 scholarships awarded to a single class. Robison and Durante are eligible for the 2018 season. Davis needs to sit out the season in compliance with NCAA transfer regulations.